2016 UK Coach Rally Coach Driver of the Year Russell Cooper from Sheffield, planned with his fiancée Klair, their dream destination wedding in Malta. Klair & Russell met each other through work links to coaches, and they both wanted to incorporate Russell's work and passion for coaches into their destination wedding with two stunningly beautiful Maltese vintage buses. Klair & Russell's civil ceremony and reception was at the Seabank in Mellieha which is all-inclusive hotel and spa. I've photographed many destination weddings there and they are great for families with young children. It's got everything under one roof, has 3 pools, adults pool, children's pool and a main pool. There's also the biggest beach on it's doorstep in Mellieha bay which is a very safe shallow swimming area. 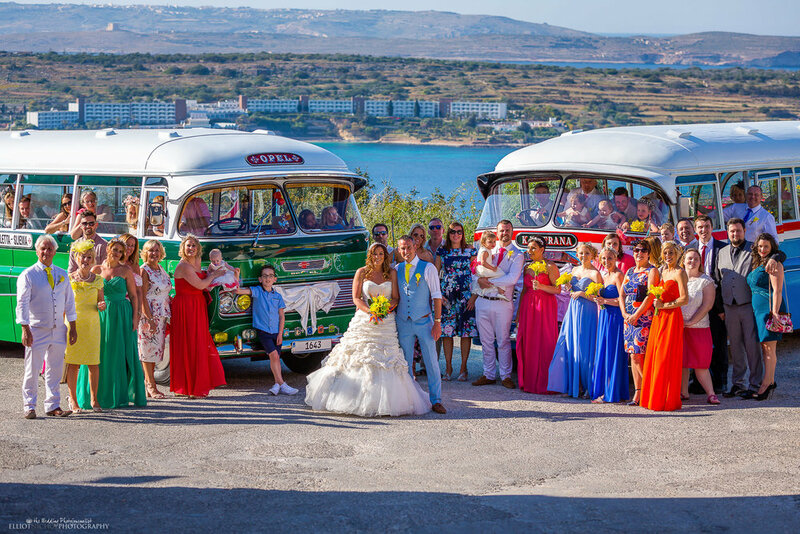 Russell and Klair booked 2 vintage buses to take their wedding guests off between the ceremony and reception to explore the surrounding area around Mellieha. Every wedding I've been to in Malta that do hire these vintage buses, I find all the guests love them and it's such a great memory to have of the day. Here are a few of the highlights of Klair & Russell's special Mediterranean destination wedding. We came accross this behind the scenes photo of us organising Klair & Russell's wedding groupshot from an online article on vintage Maltese buses.